We love surprises isn't it? We surprise our parents, wife/husband and our kids on special occasions. We also remember our dear friends with a simple souvenir item when we go on a vacation/trip. See! 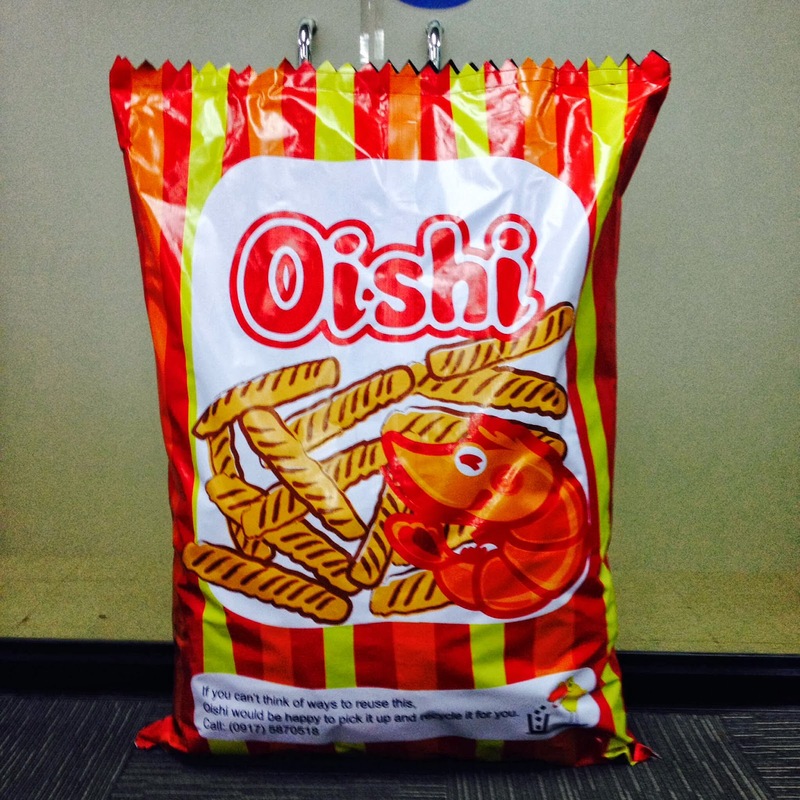 I can fit and hide inside this GIGANTIC #oishi #giftpack! Check out what'inside! You want this? Join my #blog giveaway now! 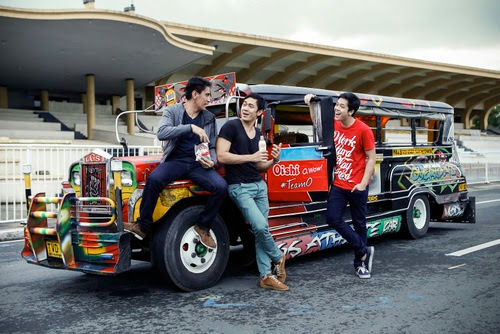 Earlier this month, Team O also known as Oishi with members celebrity Elmo Magalona, Ramon Baustista and Slater Young surprised students with a project called Jeep O. 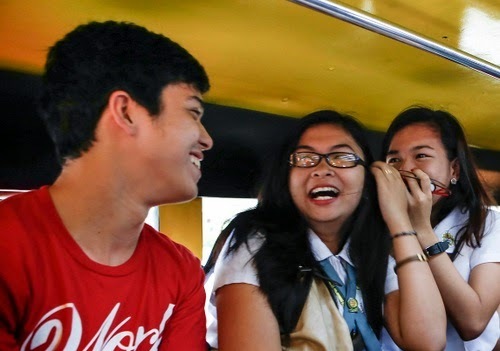 The team O members disguised themselves as regular students and jeepney riders and boarded the Oishi jeep O that went around Manila. As students would enter they would take their disguises off and surprise them with free Oishi snacks. 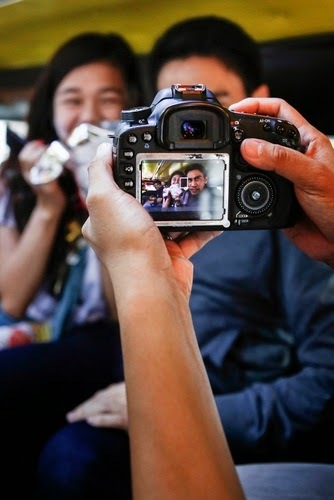 The students really had a great time during the entire trip, aside from free photo opp with the Team O they were treated with Oishi products. The surprises doesn't end there! Oishi and LivingMarjorney wants to surprise you with a gigantic 4 feet tall Oishi gift pack. Are you ready? To join, simply follow the mechanics below. There will be one (1) lucky winner. This contest is open to everyone in the Philippines who can pick up the prize somewhere in Makati (provincial winner can send a representative provided that they can show a valid ID and authorization letter). The more entries, the more chances of winning so it's better you complete the steps of our rafflecopter tool. Favorite namin yan lalo na ng anak ko. My kids and I wanna show the world that I have a 4 feet tall Oishi Gift Pack. The world is not complete without Oishi! My kids will surely love this, wanna win this. i wnt to win cause me my son and intire family love oishi snack!!! love it spicy and not vote yummy!! I want to win this for our christmas break. we will definitely eat this with my brothers and kids while watching movies during the vacation. I would also want to win this so that I can show it off to my friends and neighbors, 4 feet oishi sack/bag is something to brag about! hehehe. I want to win this 4 feet Oishi because our school will be having an educational fieldtrip next month and I want to share this to my students who will surely enjoy this yummy snack. I want to win this for my daughter, who loves munching on any oishi snack. I'm a snack food lover. This big pack will satisfy my appetite & I can still share this to all my Pamangkins! I want to win a 4-feet tall Oishi gift pack for my kids because they love oishi products. I want to win a 4-feet tall Oishi gift pack Because we Love Oishi Products and it well enjoy by my family. I would love to win the giant Oishi gift pack because I'm a certified Oishi fan. I'll share it with the whole family who are Oishi fans too. I want to give it to my little sister & my baby niece because we all love Oishi prawn crackers! I could only imagine their delightful smiles if I take home a giant pack of Oishi (I'll get my camera ready for that priceless moment!). i want to win coz ever since i'm a kid fave ko na oishi. nde nawawala yan sa pica-pica foods namin everytime mag dvd marathon kami. I want to win a 4-feet tall Oishi gift pack because I love Oishi products since my teenage years until now. favorite ko ang kerei, potato fries & Wafu leche plan. and I want to share it to my family since its my kids favorite snacks! I wanna win the 4ft tall oishi giftpack because it's a perfect snack when we have a movie marathon together with my family. Winning the oishi gift pack is a sure to bond with family! I want to win the osihi 4-feet tall gift pack because i am a super fan of oishi products and i always buy lots of gifts packs specially during Christmas and give these to kids. I want to win 4 ft Oishi because I want to give as my christmas gift to my 2 kids because they love Oishi.. I really love Oishi products!!! gusto ko manalo ng a 4-feet tall Oishi gift pack para ma share ko sa mga barkada at kapamilya ko. I want to win the 4ft Oishi gift pack kasi bitin yung 6-inch pack. hope to win. I want to win the 4ft Oishi Gift pack because parang magka height lang kasi kami hindi na ako mahirapan. HAHA. Anyways, oishi is my favorite snacks of the day especially with my friends. I'll share that 4ft Oishi to all my friends out there! I want to win a 4-feet tall Oishi gift pack because this would be perfect for kids snack at the play room while we are having our parents & teachers meeting. I want to win a 4ft. Oishi Gift Pack because I want to share it with my family and we love Oishi products. I want to win and scare my friends/relatives this Halloween with this 4-feet tall MONSTER Oishi gift pack! Because I am a big fan of Oishi! Because I am an Oishi fanboy! Dahil paborito ko ang Oishi! Because I am crazy in love with Oishi. I want to win the 4 feet tall Oishi gift pack Because I love Oishi eversince I was a kid. And i have plenty of nephew, nieces + my son that will surely love this. I also have 6 brothers and sisters and we all love Oishi. Me and my family love Oishi, this is perfect! I really love eating oishi since I was in grade school. I pair it with vinegar and sili. it tastes good and makes my merienda complete! I want to win to share it also to those people around me that would like to try the goodness and crispiness taste of Oishi, I'm sure they will love it as I do! I want to win a 4-feet tall Oishi gift packs because Its my favorite snack.. this is also my teen daughter's favorite snack especially while watching a movie at our home. Because my kids love Oishi and taking home this 4-ft of goodies and seeing their O-Wow faces is my O-Wow moment! So please let me win! I want to win because i want to share it to my nephews and nieces they love oishi so much! For more fun bonding moments with family and friends plus happiness! I want to win a 4-feet tall Oishi gift pack coz it would be great to share it with family and friends. basta tatak oishi masarap kc. I want to win this giant Oishi because I will give it to my son on his birthday.I'm sure he will share this to his friends. winning this giant oishi pack will certainly be an O-WOW moment for me and my family whom i'll share the treat with. I want it because my entire family will surely love it specially my nieces and nephews. I want to share this to all the family members while going in our province inside our jeep. mitchelle de guzman/deguzman.mitchelle@yahoo.com/... i want to win this huge oishi gift pack for jp!!!!!! I want to win because i want to share it with my entire family. will have a get together soon and this will be the perfect attraction and centerpiece of the affair. I want to win this prize 4-feet tall Oishi Gift pack for my kids they really love it and for my hobby because i want to surprise him in his birthday! I want to win because I want to share Oishi products with Joshwa;s classmates in Special Education. The kids will love that.. I want to win because it is my fave snack. I want to sleep with this big Oishi pack. Im a big fan! i want to win because i love oishi,and i want to share it with my whole family and friends. Because its one of a kind, My niece birthday is just around the corner and I want to share it with the my family and to her friends. id like to win this 4ft tall oishi for may whole family specially for my 3 daughters who will definitely be happy to see the big pack right on our doorstep. thank you in advance! i want to have this 4ft Oishi loveable Chichirya! Love it much!!!! Best gift for a family that is truly in love with oishi! The best for A Fan Oishi to have this and share with my family! Stay tuned, we have lined up three (3) more giveaways! Merry Christmas in advance! Thank you so much! :) Grabe!! Super happy!